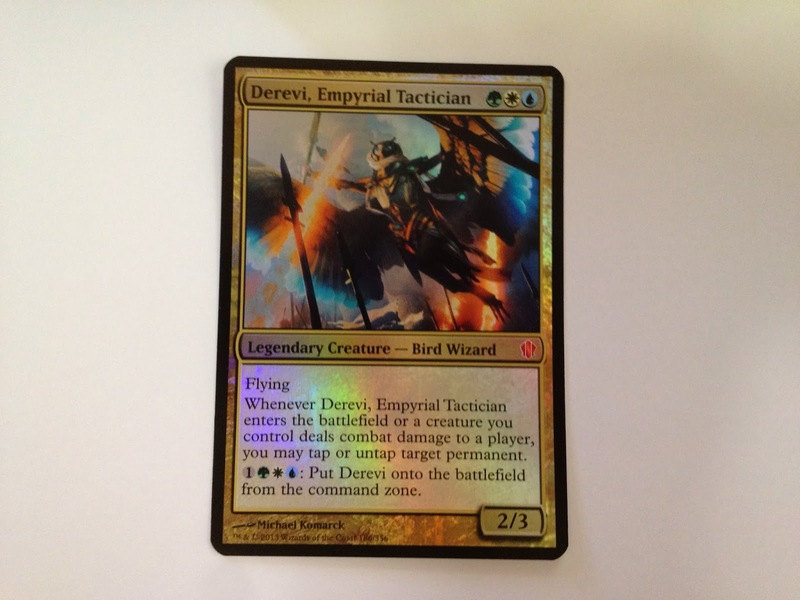 Evasive Manuevers….Commander Deck Unboxing and Review. 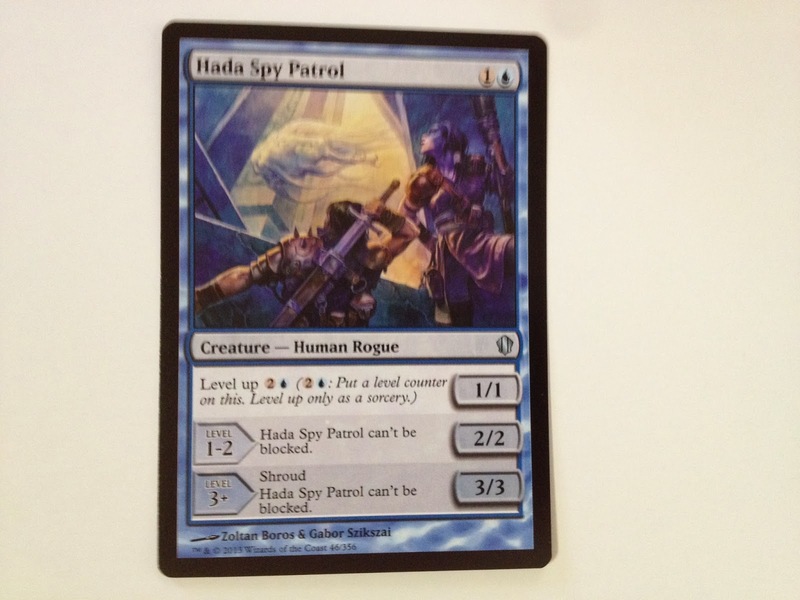 Commander, or EDH (whichever you prefer,) is a format for Magic: The Gathering that people seem starved for…Usually they are trying to sneak in a round in between Standard tournament matches, etc. I have been sort of puzzled by that…thinking it is fun…but is it that fun? BUT that was before this deck! I think the reason I have had “meh” feelings about the whole thing is that my decks didn’t really “do anything.” They were more of a collection of cards that I like…that were generally unplayable in standard for some reason. So my first cohesive deck is one that I buy ready made, it it works great! When you open the box, you see this. and here are the contents, underneath the foils. card of these also, as they complete the 100 cards. But clearly Derevi is the star! 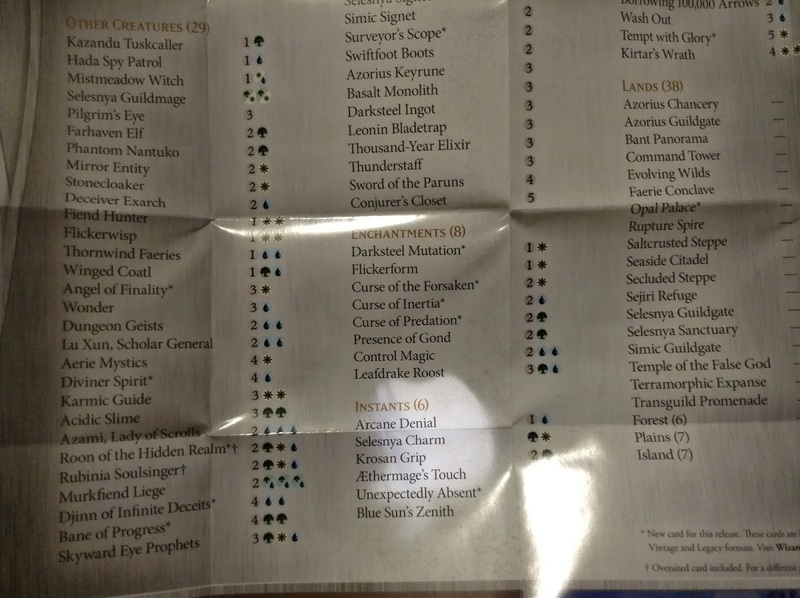 Here is a picture of the deck list. 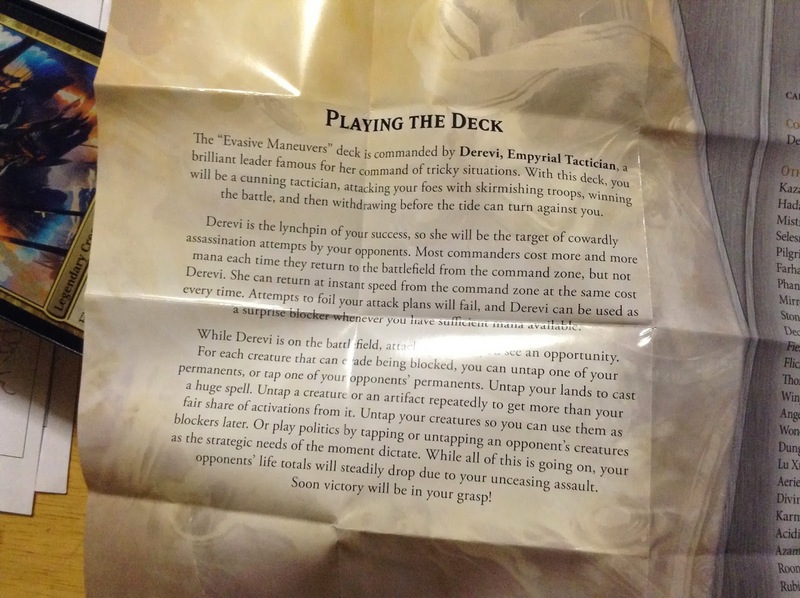 Here is some blurb about how to play the deck. I wish I could have made it to a “serious” tournament before this review…unfortunately Christmas Singing obligations kept me away from the one at the Tangled Web today. There are two more planned for the future that I know of, and I may be able to attend those and play this deck. So my first match was against my oldest son, who is currently playing a self built Excava, Blood Witch Commander deck. (See Excava here.) 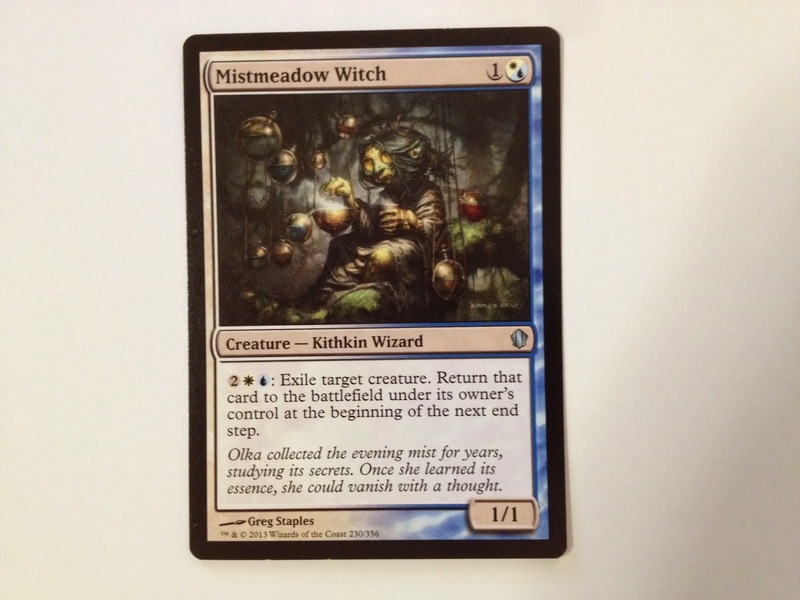 It is an aggressive Rakdos strategy, and he uses a lot of burn spells and haste, as well as favors goblins. I beat him soundly! And on all fronts. Here are the cards I used to do so….There are certainly more cards to see, however. as I showed off the deck to the people at the Standard tournament at the TW. This card is kind of a more powerful Tidebinder Mage. It flys…so….He had no flyers. 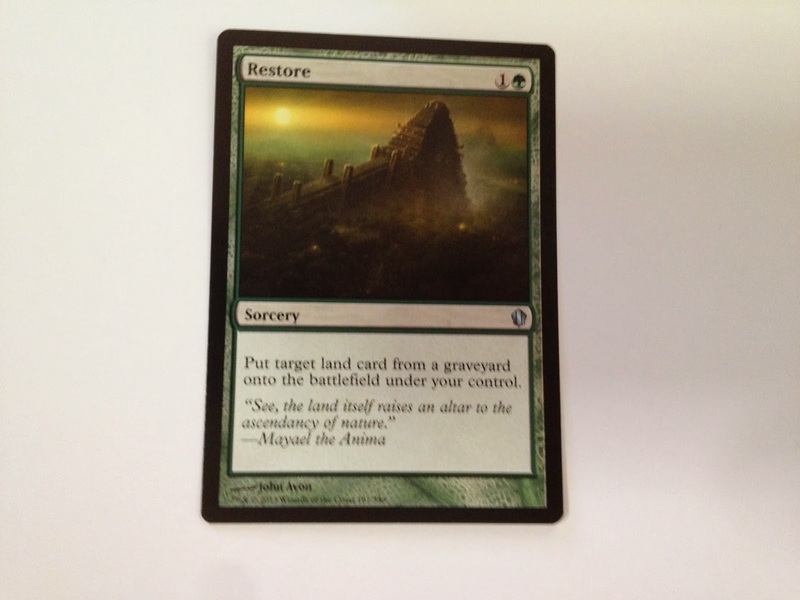 This is apparently a reprinted card from the ancient past of Magic. I used this to cast Blue Sun’s Zenith, (not shown here). But that instant put cards in my hand when I was starting to feel a lack of fun because I had no hand anymore. but have played against people that do at Modern tournaments. This was one of my last plays. It didn’t get to do much…. 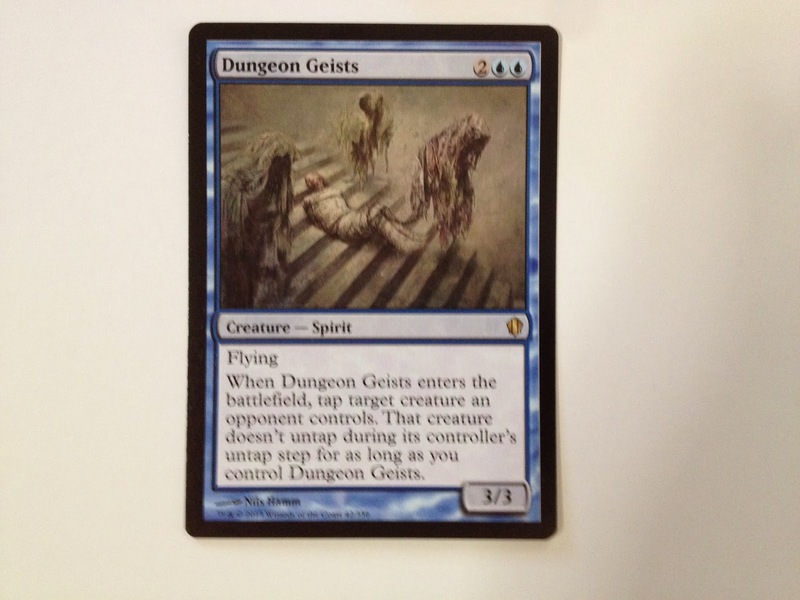 I put this card onto Dungeon Geists…I never had to use it, though. they were part of me winning the game! I mention this because one of the key things was that MANA WASNT A PROBLEM! Rubinia made an appearance, giving me control of Krenko, Mob Boss. My son really didn’t appreciate this, so he just burned her. A key point to remember for the future…She’s not to hard to kill off. AND, if she’s tapped, she isn’t doing much else, is she? Thoughts on the match…Excava is no lightweight…But I just had more access to stuff. 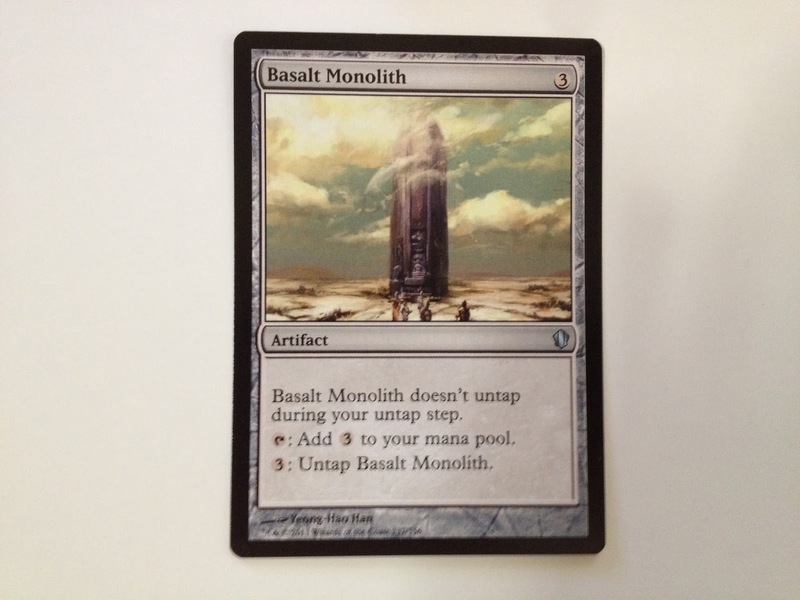 I had out Darksteel Ingot, Basalt Monolith, and Selesnya Signet, in addition to 12 basic lands and Faerie Conclave and Bant Panorama. By the end of the game…with the mana-fixing artifacts coming out early giving me the power to do just about anything I wanted. The game ender came after all this. 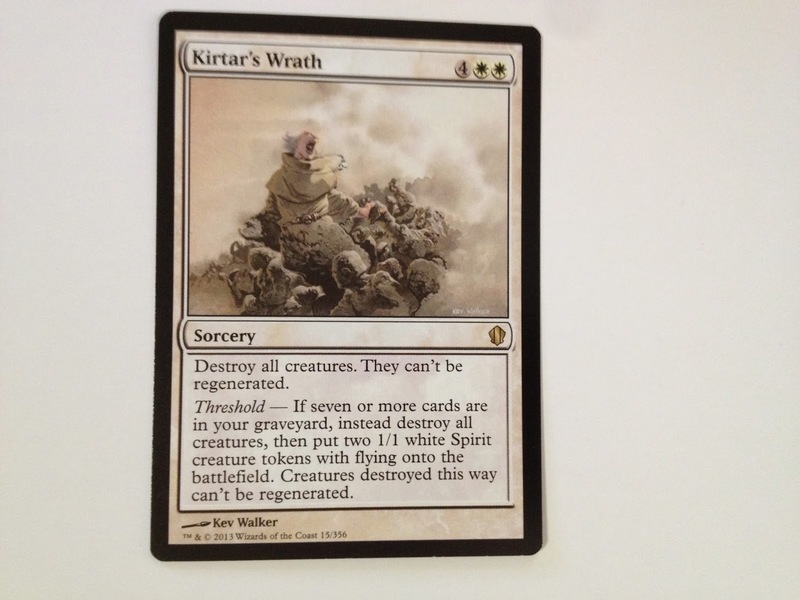 I got out Kirtar’s Wrath, and nuked everything. He had more stuff out than me, so it was not biggie…This gave me the upper-hand with the two spirits, then I was able to also get Derevi out of the command zone. At the END OF HIS TURN (So he was ready to attack next turn! 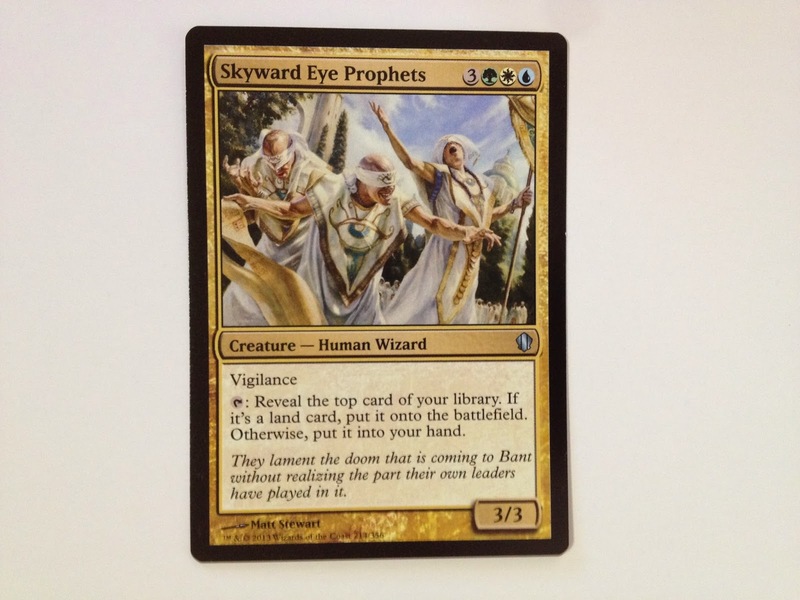 Then I played Aethermage’s Touch, which got out the Skyward Eye Prophets, and I got to play Curse of Predation. SpartanSmurf #1 didn’t have much life left, so when I swung all-out, it was curtains for him! Commander damage didn’t even figure into all of this…It was all regular damage! 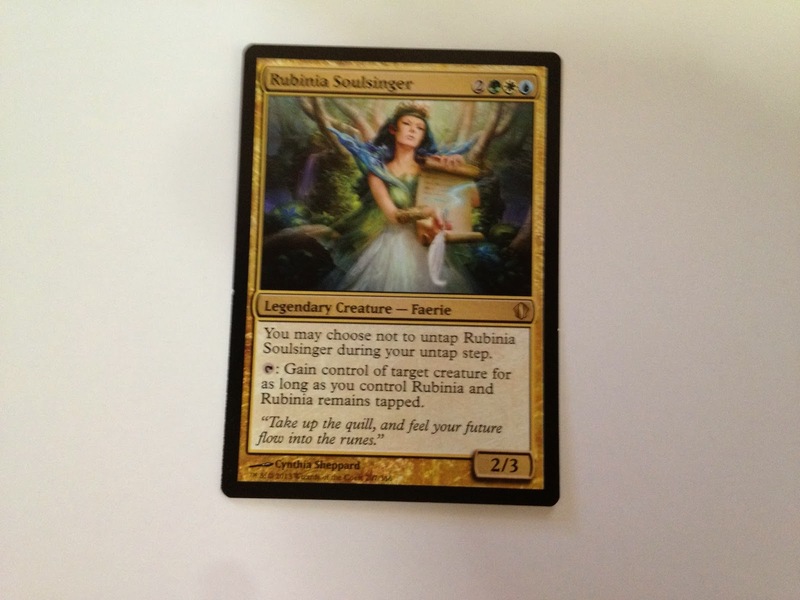 Thoughts on what you get.…You get the three commanders…all Bant, so that’s cool. I especially like the Rhino…Rhino’s are becoming one of my favorite animals. (Maybe it is their big nose!) Some of the cards in here are apparently lusted after by long-time players. “Sol Ring,” for example. You also get a pretty nice box…But it won’t fit your cards if you sleeve them…it is a snug fit as it is. I am keeping the deck list for reference. 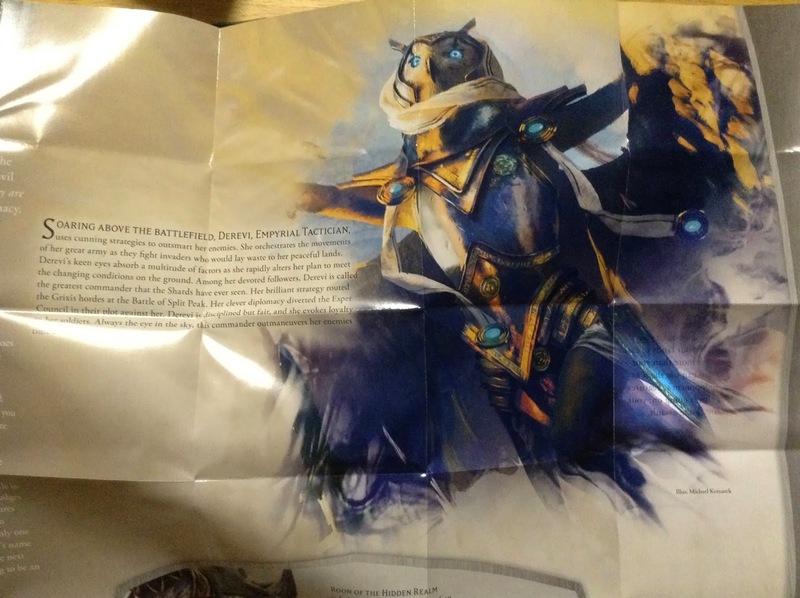 The Wizards are wasting paper by including the blue propaganda that comes with almost every Magic: The Gathering product. 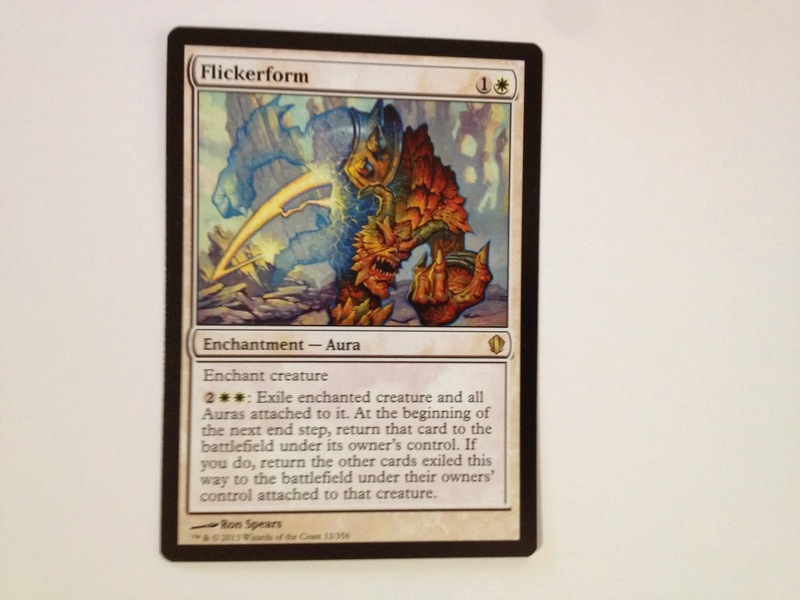 This entry was posted in Basalt Monolith, Commander MTG, Derevi, Empyreal Tactician, He-Man, Kirtar's Wrath, Magic the Gathering, Oloro, review, Sol Ring, SpartanNerd, The Tangled Web, unboxing, Wizards, Wizards of the Coast. Bookmark the permalink. 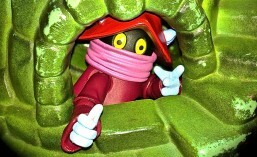 ← 10 PRINT…"Top Ten Video Games I Miss"